Styled with an understated urban feel, this contemporary strap watch by Fossil is perfect for accessorising your casual look. 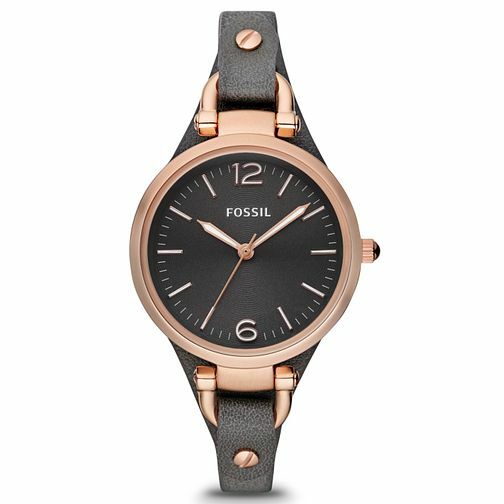 Fossil Ladies' Grey Dial Gunmetal Grey Strap Watch is rated 4.0 out of 5 by 1. Rated 4 out of 5 by Anonymous from Nice looking watch, comfortable with clear, easy to read face On the whole I am very happy with this watch. It looks good on, is comfortable to wear, and has a very clear and easy to read face - the hands even glow slightly in low light which is great. My one criticism is that the strap actually looks more brown in some lights than the dark grey that I had envisioned and was ideally after.